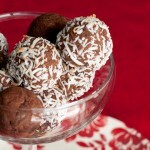 These easy to make chocolaty balls are sugar free and loaded with rum… and fiber rich coconut. Preheat oven to 350 and line a cookie sheet with parchment paper or silicon baking mat. Combine eggs, dates, coconut oil, rum, and vanilla in a blender. Blend until smooth. Pour into a medium sized bowl and add coconut flour and cacao powder. Stir until combined. 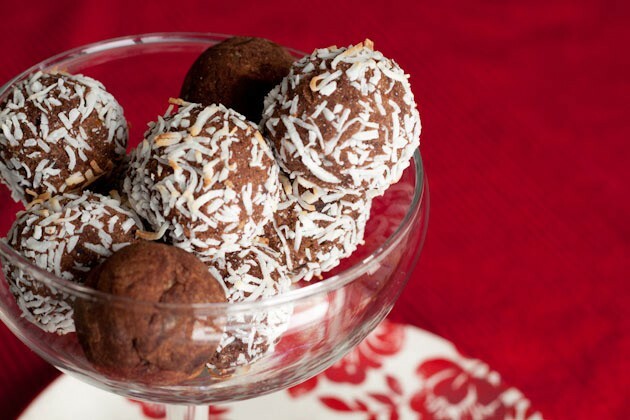 Shape batter into balls and roll in shredded coconut. Bake for 12-15 minutes or until coconut is starting to turn golden. Remove from oven and allow to cool for 5 minutes before transferring to a cooling rack for 10 minutes.